Happy Monday !! How are you ? Around here, its been getting chillier even by the day. So the oven is on full time. well almost. and I have been baking and eating lots of breads, cookies and cakes. Also roasting a lot of root vegetables and loving it all. I am specially in love with this sinfully delicious Persimmon Bread... with Bourbon, walnuts, dates and the chilli flakes.. Yes chilli flakes. Do I see some brows frowning over that ? Oh please don't. It really is wonderful. The original recipe is by James Beard. I found it in David Lebovitz blog, made an eggless version of it and spiced it a bit with red chilly flakes. I borrowed the idea of adding chilli flakes from a Turkish Persimmon Bread recipe and I am so glad I did. 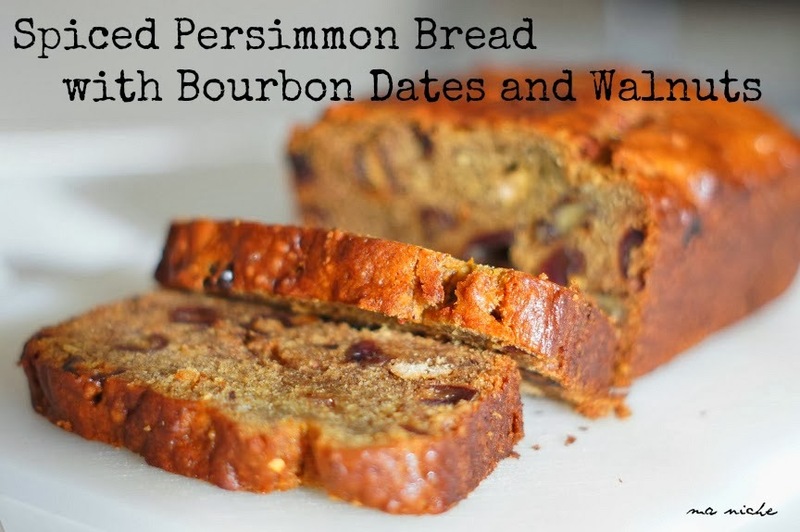 The Bourbon, the dates and the chilli flakes are such a riot of flavors.. and yet so rich and gorgeous. Ever since I made this bread, I have been looking for more sweet bread recipes where I can fit these flavors in. I have found some recipes... will soon let you know how they go. 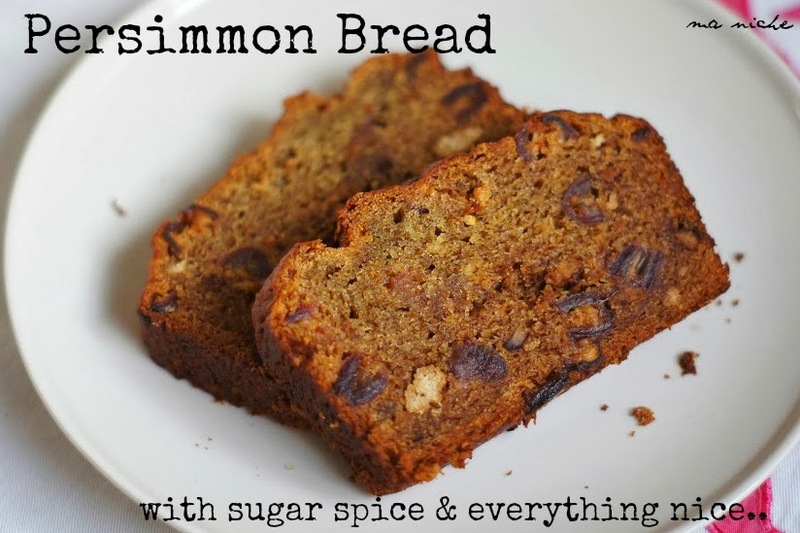 This sweet bread is perfect for the season. Its great with tea as well as coffee. also great for pacifying the late afternoon or late night sugar craze (in case you like to give in to that sometimes). 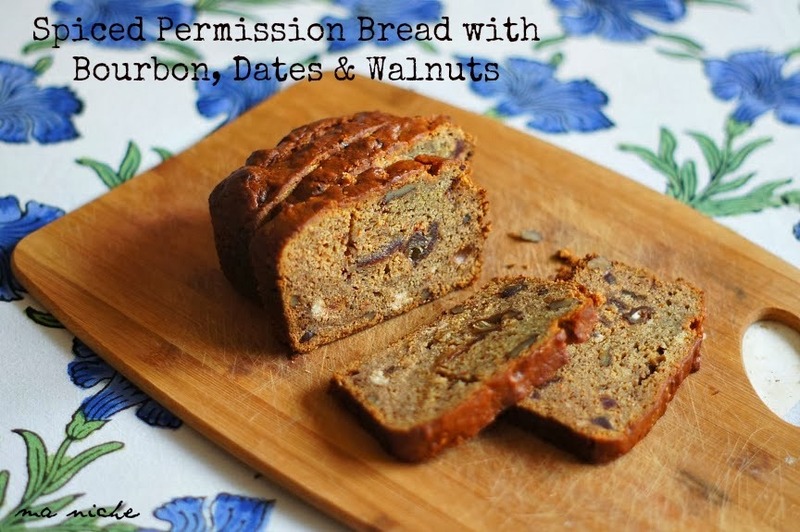 So if you are in the mood to indulge yourself bake this delicious Spiced Persimmon Bread with Bourdon Dates and Walnuts right away.. You'll love it ! Grease a 9x5 inch loaf pan and line the bottom with a piece of parchment paper. Sift together all the dry ingredients except sugar into a large mixing bowl and keep it aside. Switching off the heat beat the sugar into the melted butter. Once the sugar has been well incorporated, beat in the yogurt, Bourbon and persimmon puree and beat till all the ingredients have been well incorporated. Make a well in the center of the sifted flour mixture. Pour in the liquid bourbon-persimmon puree mixture into the well, then add the chopped walnuts and dates and chilli flakes and using a wooden spoon mix everything well. Now pour the cake batter into the prepared loaf pan and bake in the preheat heated oven. After 25 minutes reduce the heat of the oven to 350 degrees F and continue baking for another 35-40 minutes till a skewer inserted in the center of the loaf comes out clean. Cool the loaf completely before slicing and enjoying. Masoor Dal, Roasted Roots Vegetables with Sauteed Baby Spinach, Rice. Mm, that looks delicious! Thanks for sharing the recipe. The combination of sweet dates with spicy chile flakes sounds very tasty. The moistness and texture of the bread looks particularly wonderful! Love all the bits in your loaf! OMG that sounds and looks fantastic. A new favorite. Come and visit us. We have a fantastic contest this week. We are giving away a Delta faucet and you would love it for your kitchen! Your Persimmon Bread looks so moist and full of flavor and your menu looks awesome! Thanks so much for sharing with Full Plate Thursday! This is just fantastic Tanusree. I love it. You had me at bourbon. I'm featuring this at this week's Thriving on Thursday. Terrific looking bread. Really interesting ingredients. Good to see you back at the party. Pinned. Thanks for bringing this to Weekend Bites.